Regarded as on of the best Viburnums of all, Viburnum ‘Eskimo’ has a number of attribute desirable inane garden. 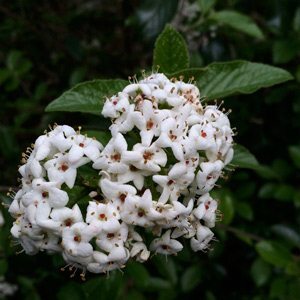 It has masses of white flowers from spring to summer, attractive evergreen foliage, and it is also low care. This is a hybrid that is naturally bushy in habit and compact growing. Over time it will reach around 2m in height, however it does remain bushy. White flowers with a touch of pink to around 12 cm wide, followed by small dark red berries. The glossy foliage adds year round interest in the garden. Uses as a feature plant in a lawn, or a background plant in the garden border, Viburnum ‘Eskimo’ should be planted where the flowers can be appreciated. A humus rich well drained soil in full sun to part shade. This is a slow to medium growing plant that can easily be pruned to a rounded bush of around 1m if required. In colder climates, or very cold winters it may drop some foliage. Mulch around the plant to help maintain a cool moist root run. If you need to prune, try just after flowering, a gentle clip back each year can maintain a smaller, or more formal looking plant.